Luke Arscott says Dings Crusaders’ “desire and drive” was the source of their title winning campaign in South West Premier last season. After the disappointment of their play-off defeat against Wimbledon in 2017, Arscott guided the Bristol-based side back to National Two South after a three-year absence. The Crusaders secured 20 victories last term - racking up a century of points in the process - and now they are preparing for life back in the fourth tier under Arscott’s stewardship. “It was about going one step further after finishing as runners-up and losing out to Wimbledon. Arscott joined Dings at the beginning of last season as a player/coach and the former Bristol man wanted to instil the fun of rugby back into the Dings squad. After achieving this and promotion back into the National Leagues, Arscott is keen for his “ambitious” club not to get too far ahead of themselves. “The biggest thing for me is that everyone got into rugby because you enjoy playing the game and I think the guys at Dings lost that a little bit,” Arscott added. “For me, it was getting that back and trying to get everyone training and enjoying themselves with their mates. It is a sacrifice which they go through when they train two times a week and play on a Saturday with not much reward. Obviously, this year will be a lot tougher going forward in National Two. “I don’t think we want to get ahead of ourselves, but it would be silly for us not to say that we’re not ambitious. 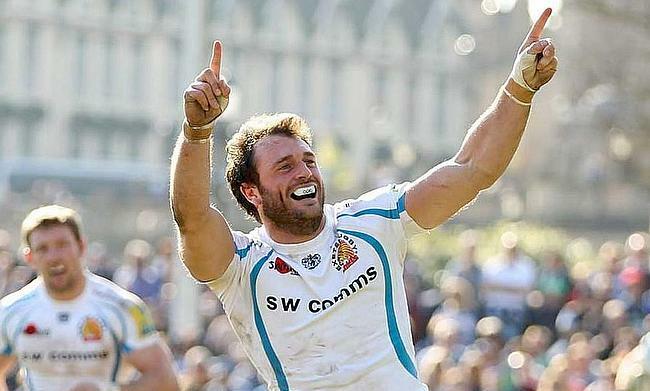 Arscott is now focused on taking Dings to the next level more as a coach rather than a player and despite representing the likes of Exeter Chiefs, Bath and Bristol in the past, he is almost ready to hang up his boots. He added: “Obviously, as the years have gone on, the legs get a little bit older and it will be more of a move into coaching. Maybe one more year of player/coaching and then we will see how it goes! The next challenge for Arscott is keeping Dings in the National Leagues. Three years ago, the Crusaders picked up just three wins in National Two South and lost 17 games in a row which condemned them to relegation. Their last win in the fourth tier came in November 2014 and Arscott insists they cannot look at what the club have done in the past because it is all about the future. “A thing that has struck a chord with me throughout my career is one thing one of my coaches said which was it’s important not to get on that emotional roller-coaster,” Arscott said. Arscott also admitted he has a clear target in his mind of what the club are aiming for this term as Dings prepare for their opening fixture against Redruth on September 1st.